Ukrainian President Petro Poroshenko has ordered Prime Minister Volodymyr Groysman and head of Kyiv City State Administration Vitaliy Klitschko to take steps to ensure adequate public order and safety, the press service of the President has reported. 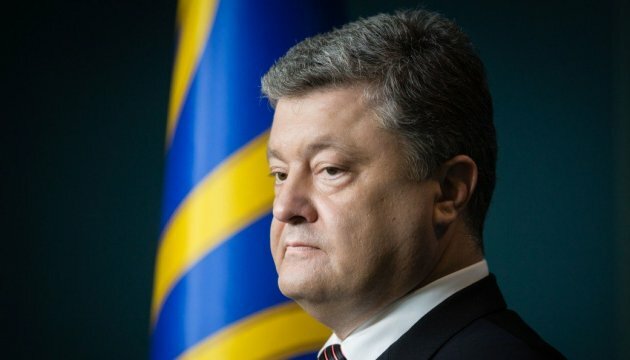 "Providing peace and confidence in their security of all citizens living and visiting in Ukraine ought to become a priority in the activities of the Cabinet of Ministers of Ukraine," Poroshenko has written in his letters to the head of the Government and the mayor of Kyiv. He noted that [prevention of] an incident of notorious terrorist attack in central part of Kyiv city in a manner that poses a threat to the lives of many people requires strengthening of measures to combat crime and secure public safety and order in the capital city and the Ukrainian regions. "The incidents that have taken place recently in Ukraine are demonstrating a rise in terrorist threats and a steep worsening of crime situation that are connected with both uncontrolled circulation of weapons, explosive devices and ammunition obtained domestically and amid the Russian aggression which is aimed at destabilizing socio-political situation in Ukraine," Poroshenko has noted.